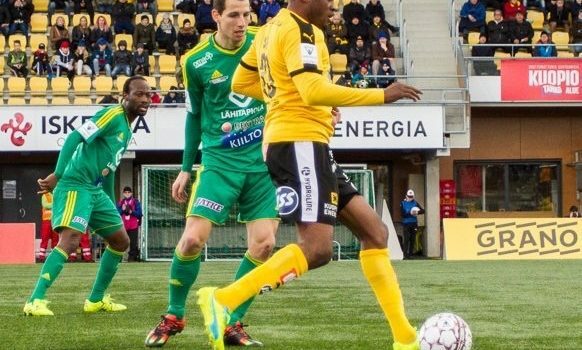 Nigerian striker, Gbolahan Salami has won the new Kuopion Palloseura (KuPS) goal scoring-trophy, following his goal-scoring prowess in his first season with the Finnish club. Salami scored his 13th league-goal of this season reaching the new club record in the Finnish Veikkausliiga league. Striker Ilja Venäläinen scored 12 league-goals in season 2013 and striker Peter Sampoalso scored 12 league-goals in season 2001. The 25-year-old striker will be the best scorer for KuPS this season winning the club’s scoring-trophy. Meanwhile, the former Shooting Stars, Sunshine Stars and Warri Wolves striker is not yet done with his goal-scoring instinct for the Yellow-Blacks in the ongoing Finnish topflight.